A place called Spring Lake Beach makes you think of a refreshing respite from this miserable heat we’ve experienced lately here in Rhode Island. There are canoe and paddle boat rentals, children’s slides, a swim dock – everything that contributes to a day of family fun. Right? Well, on this past Fourth of July, more than 90 people were affected by a gastrointestinal illness after swimming in the lake. Here in the Ocean State, the waters are tested regularly for safe swimming. Sometimes certain beaches, especially those without a regular turnover of water (no waves), or due to rain or sewer runoff, are closed for a few days until levels are back to normal. 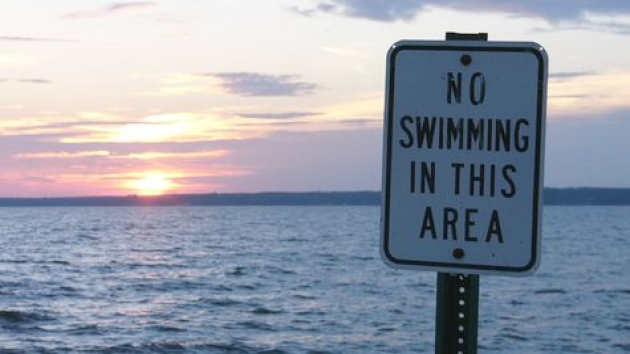 In this case, the Rhode Island Health Department Director announced that a human pathogen known as Shigella was probably spread throughout the lake from the feces of maybe just one swimmer. News reports indicated it was likely a parent bringing a diapered infant into the water. Spring Lake Beach is in the northwestern corner of the state, and fed by a spring, not the Atlantic Ocean. The more popular beaches lie along the southern shore of the state all the way down to the Connecticut border, and on Aquidneck Island. These beaches have good surf, and when you swim, you’re swimming in the ocean. A few days ago, during this heat wave, my husband and I headed south in the afternoon. Because we’re the smallest state, nothing is ever that far away. For us, it’s about a 40-minute drive to Narragansett and the beaches. I packed sandwiches and soft drinks, loaded a couple of chairs and towels into the car, and off we went. Ahhh! At least ten degrees cooler at 4:00 pm. There were still plenty of people on the beach, and who could blame them? Driving back north to Providence or elsewhere in the state was something no one looked forward to doing. Oh man, I thought, I’m not going anywhere near it. The outbreak at Spring Lake caused a total of 92 people to get sick. Sixteen of them, all kids, were hospitalized due to fever, cramping, and bloody diarrhea. Is this what we have to fear when we go swimming? So my question is – who in their right mind would tote a not-yet-toilet-trained baby into the water? Who wouldn’t insist on everyone using the facilities before going into the water? I’m really trying to lose the pictures that have crept into my mind. I actually feel sorry for the folks who run Spring Lake. This is the first time they’ve ever had a problem, but it’s hard to erase that knowledge. They don’t even allow gas-powered boats on the lake, to keep it clean. I’ve never been, but I bet it’s a really nice place. And as much as I love the ocean, I think I’d rather swim in a pool these days. Maybe one of those salt-water pools. Next ›Author of the Month! And I need to remember to log out of work when I comment here! Lol! Glad you knew it was me, Martha! I mess up on FB and twitter too.. When the girls were young, we were at Spring Lake a lot. Hope things get cleared up. I do, too, Geri. They’ve taken every step possible to do so. This was an isolated problem for them, but unfortunately too common at the shore these days. Ewwww. One MORE reason not to go into the ocean! My mother lived on Anna Maria Island and took my children there frequently. I took the children deep sea fishing once and we caught so many scary creatures- barracuda, sharks, eels and creepy snake fish– that NOBODY would go back in the water! It was the pool after that! You know, I’m sure everyone has tinkled in the ocean once in their lives – certainly a little kid who hits the cold water and can’t hold it. But feces in the water is a whole different matter – ugh, it pains me to even think about it, Kim! Another thing to consider ( and this is really disturbing) is a lot of people with sailboats don’t use their tanks because it makes the boat smell of chemicals. This means everything that goes into the toilet is going directly into the water. So you really aren’t safe anywhere. I hope that didn’t ruin your day. It ruined mine when I found that out. That is disturbing, Kim – ugh! Yes Martha, a salt water pool on a cruise ship preferably! !